You may (or may not) have noticed that I didn’t end up liveblogging the Oscars the other night. This was for various reasons, the primary one being that there doesn’t appear to be a single location in London that possesses both Sky Movies Premiere and an adequate WiFi connection. Regardless, I had a gay old time wallowing in what was a remarkably seamless ceremony, filled with justifiable wins, occasional funny moments and numerous references to one very important movie. 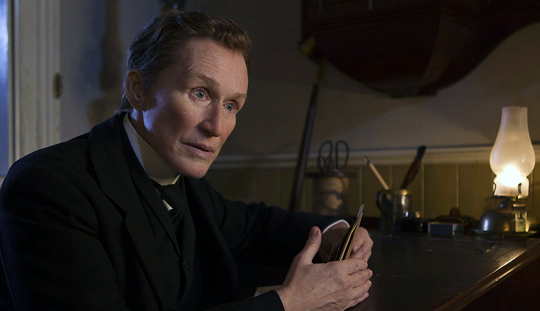 Albert Nobbs has long been a pet project for its star, producer and co-writer Glenn Close, who first played the role of Albert — an introverted woman living as a man in 19th Century Ireland — on stage in 1982. Nobbsy finally made it to the big screen last year courtesy of director Rodrigo García, and premiered at the Telluride Film Festival to mixed reviews. Based on a character from a 1918 short story by George Moore, Albert Nobbs is a sharply-dressed hotel waiter with an insane Irish accent and an ironic misnomer for a surname. His singular ambition in life is to … (wait for it) … open a tobacconist, and so the film is packed with honey-tinged visions of this wondrous fantasy, complete with Mia Wasikowska as Nobbs’s dream wife and co-worker. It is, without a doubt, 2012’s best character motive. Another highlight comes later on in the movie while Nobbsy is preposterously trying to date Mia Wasikowska (seriously, the movie’s one banana skin away from slapstick comedy). Sensing a rival in Aaron Johnson’s character (yep, he’s in this too), Nobbsy insults him, to which Mia responds with the MOST PATHETIC PHYSICAL ATTACK EVER CAPTURED ON FILM. Imagine a kitten trying to beat up a lamppost. I won’t ruin it here by going into any details but the ‘dresses’ scene will reaffirm your faith in storytelling, drama and life itself. Needless to say, it proved quite the conversation starter at the Oscar party I attended. After struggling to find a UK distributor for most of last year (rumour has it one exec hacked off his own limbs to avoid accidentally signing a distribution contract), eOne have finally picked up Nobbsy and are due to release the film on April 27th. I highly recommend a ‘pre-lash’.